We celebrated Iya’s 2nd birthday party at home. The whole day was spent on preparations although we woke up later than usual. We made the table arrangements at the balcony together with Henry’s batteries and satellite dishes. We had Nanay’s orange/ fall themed curtains as our table cloth, which was very timely given Iya’s favorite color is orange and holloween is a few weeks away. We also bought orange balloons and attached it to the chairs. It was cute and decent for a small house party. and Gulaman for our drinks. 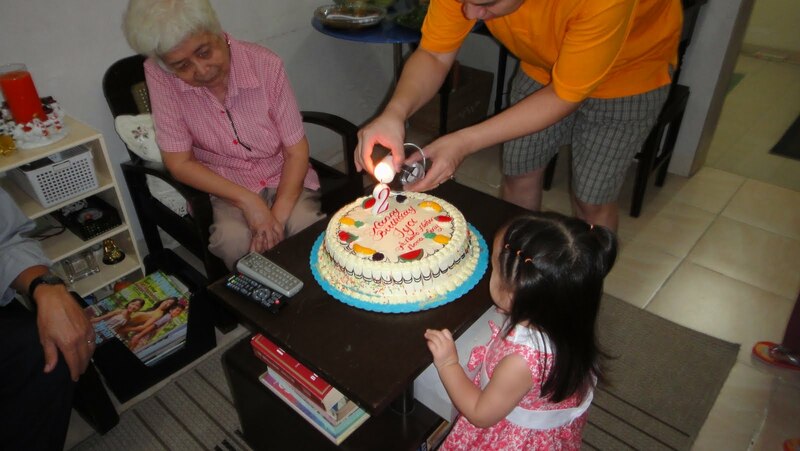 We started with the “blowing of the cake” from Lolo Floren and Lola Nely. Iya’s so demure! Her blow is like a kiss from a butterfly, barely making any flickering movement to the flame. Henry was the one who blew it for her this time. She was smiling and looking at everybody while we sang Happy Birthday. We ate afterwards, our parents, Iya and I, took advantage of the al fresco dining while our friends and Henry ate inside and watched a video. She loved the crispy noodles and did not want to eat fish. So I had to sneak little fish meat and vegetables every spoonful. After eating I sliced the cake for dessert. She ate a little cake and played with Gian, our friends Roy and Gina’s little boy. As usual she’s such a lady and a little worrysome whenever Gian touches her toys. She kept on saying “wag tapon” (she’s protective). There was also a time when both of them were tugging for the same toy she said “Wag malakas!” because she was losing! But she shares, and hands Gian her toy fork. We love you baby! May you grow up God fearing and with lots of love in your heart. Always remember that we are here for you no matter what happens. You are our greatest gift!